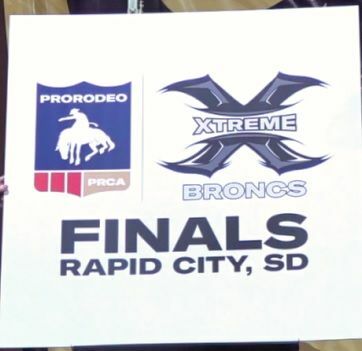 Xtreme Broncs Finals coming to Rapid City in August. RAPID CITY, S.D. - As the crowd cheered the cowboys in Wednesday night's Xtreme Bronc Match, Rapid City also found it would host the finals later this year. The Pro Rodeo Cowboys Association announced Rapid City as the new location on Wednesday morning during the Black Hills Stock Show's Broncs for Breakfast event. The Xtreme Broncs Tour is a series of events that features only saddle bronc riding. The finals will be the end of a 20-stop tour throughout the U.S. and will be nationally televised. This has been in the works for the last nine months and the PRCA says they chose Rapid City because of the great saddle bronc riders produced by South Dakota, such as Casey Tibbs. President of the Central States Fair Board of Directors John Kerstiens says this will mean a great deal to the state and to the local economy. urban population we are trying to excite and bring to our shows." Pro riders, such as the current world champion in bronc riding Wade Sundell, along with Cort Scheer and South Dakota's Chad Ferley and Jade Blackwell attended the big announcement and they are excited to see this competition held in the Black Hills. "I grew up 10 miles down the road and to compete for that kind of money and not have to go very far, it will be a big game changer," said Blackwell, who is from Piedmont. "It's a big deal for Rapid City and bronc riders," said Ferely, who is a two-time bronc riding world champion and grew up in Oelrichs. "Bronc riding has always been real popular around here anyway and with the amount of money they are putting in it these days is amazing." The Central States Fair and Range Days Rodeo will host for the event on Thursday, Aug. 22, 2019 during the Central States Fair.